In large bowl, mix brown sugar, 1/4 cup granulated sugar and the cornstarch. Stir in ginger and lemon peel. Add pears; toss gently. Spoon into crust-lined pan. Dot with butter. Top with second crust; seal edge and flute. Cut slits or shapes in several places in top crust. Brush crust with water; sprinkle with 4 teaspoons sugar. Bake 40 to 45 minutes or until pears are tender and crust is golden brown. After 15 to 20 minutes of baking, cover crust edge with strips of foil to prevent excessive browning. Ripe Anjou or Bosc pears work well for pies; choose fruit that is fragrant and slightly soft to the touch. 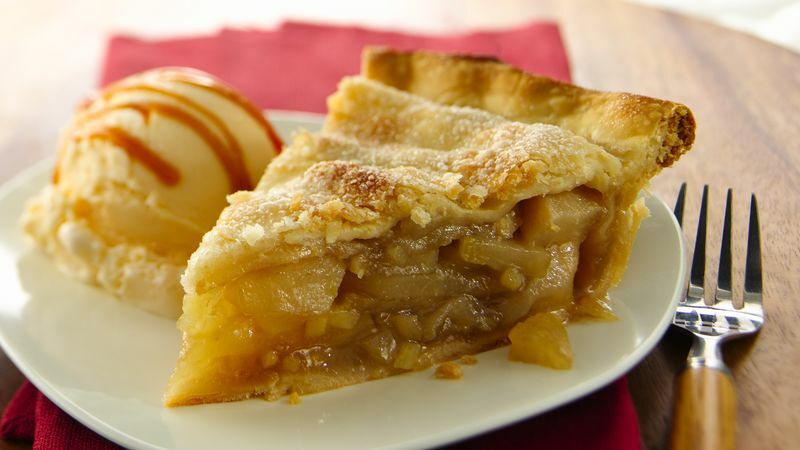 Serve this pie warm with a scoop of vanilla ice cream drizzled with caramel sauce.